I've run my hands over the world's finest cashmere, the fullest mink and fleece so soft you feel you are running your hands over heaven. 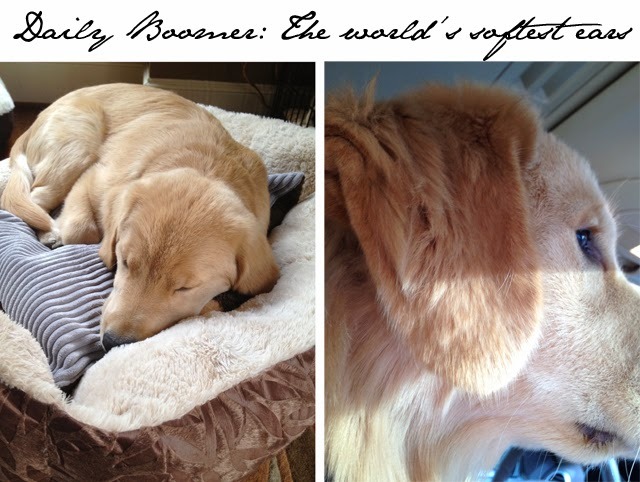 Yet never in all my days have I ever felt anything as soft as Mr. Boomer's ears. As a puppy you come to expect that the ears are beautiful and soft as velvet. As your pup becomes a dog, the ears usually lose a little bit of their special softness. However, my little friend is showcasing a truly unique feature in keeping his double layer full ear feathers as he approaches toddler-dom. Even as I write this, he is sitting beside me running his head up against my leg begging for attention. I can't help but spare a hand to run my fingers over his head and finish with an ear tug. So that's today's share for your Daily Boomer. If I could share one thing with you all, it would be a quick ear rub with my Boomer. One feel of this golden's velvety smooth ear against your cheek and I fear you'd be locked in love forever.